Worrapolava: Falling into Cicada: brilliant album alert! Just when you thought the album was redundant due to the lack of any decent ones, along come several to blow that theory away. Filthy Dukes, Pet Shop Boys, Royksopp have proven this year, that with a bit of thought and passion you can release 14 or so well-crafted songs and call it an album. 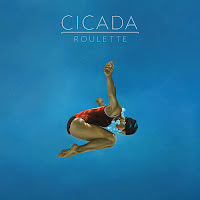 And now Cicada, with their new release Roulette have done exactly the same. It's heartwarming to be able to play these electro/dance-tinged pop songs from start to finish (beautifully sequenced, by the way) and then hit repeat. All beef, no gristle. The strength of it lies in the songs. Even the three instrumentals are built to a song formula, so much so that the "aaaahed" vocals on Tiad give the impression of words being sung. But of course, a great album has loads of different qualities, not just the accomplished songwriting. Aaron Gilbert (3rd from right), Alex Payne (2nd from right) and Duncan Mills (far left) recruited the enigmatic GusGus singer Heidrun Anna Björnsdottir (far right) for most of the vocals. She brings light touches to the heavier tracks (Falling Rockets) and depth to the emotional tracks (One Beat Away, Tears). But Heidrun really shines on the song of the album, Love Don't Come Easy (see the widget below). This track is MAJOR and made Jake Shears twitter his love for it. Incidentally, she also provided vocals for the two stand-out tracks Out of Love and Uptown on one of the albums of 2007, the much overlooked Pleasure 2 by Pleasure. Roulette is the great summer holiday album. Listen to Don't Stare at the Sun (see widget below) and imagine people-watching on a sun-kissed beach or baking your bones poolside. The single, Metropolis, is a perfect pavement-cracking accompaniment while you clink bottles of pear cider and Friends is the sunset soundtrack for a view across some bay or other. Go buy the album here and here and see for yourselves. Stream the whole album (and buy) here at 7Digital. 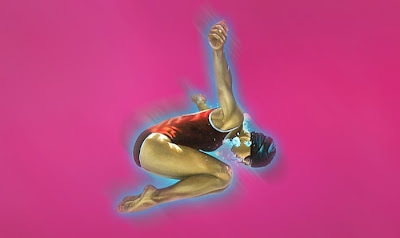 Two great remixes of album tracks Metropolis and Falling Rockets are available here at the lovely !Tashed. And below is the video for Metropolis - "I will scream! I will shout, shout, SHOUT!" For Aaron, Alex and Heidrun as Cicada, this is their second album, their first eponymously titled release was just as strong and Roulette can only build on the interest it generated in 2006. For a list of the MANY remixes they've done over the years - most notable are Lorraine's I Feel It and Soft Cell's Memorabilia - go here. ohhh ive seen that link before, i enter yesterday but..its just 30 sec of each song =/ ive been searching for this in the whole net for days hehe, im buying it for sure but its not avabile till tuestday over here, i seriosuly cant wait hehehe, i really want to listen tiaddddd and one beat way.. im sur ethey are awesome..
Once again, you have turned me on to something amazing. I will be ordering a physical copy of this Monday (as I did for Filthy Dukes--WOW). With Little Boots and La Roux coming, in addition to Royksopp and Pet Shop Boys, I think I've found electro-heaven this year! What's next, Goldfrapp returning to their synthy sound? what a bloody brilliant find. The only thing that has got me to stop playing the Little Boots album. Tremendous. I am mentally obsessed with this album. It's amazing. I think they did the remix of I Feel It that I love so much (by Lorraine). And I had no idea she was behind Out Of Love. Brill! Anon,Countpopula, Paul and Talia. This album has been playing non-stop. I loves it. And XO, you're right. Theirs is that great mix for Lorraine... Aren't they great with their own stuff? Only got my copy of this album yesterday and, since then, it's been on repeat. Quality, really gorgeous.